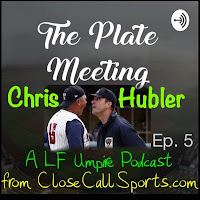 Welcome to the fifth episode of The Plate Meeting, a LF Umpire Podcast from Close Call Sports, where we talk umpiring with umpires. In episode 5, Tmac and Gil chat with MiLB veteran and Jim Evans Academy clinician Chris Hubler about his professional baseball career, JEAPU affiliation, and modern changes to the game. 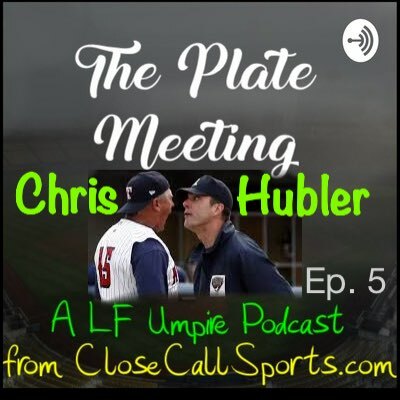 Click the below "play" button to hear Episode 5 - Chris Hubler's View and Jim Evans' Play, Too, or visit the show online at https://anchor.fm/the-plate-meeting to subscribe. The Plate Meeting is also available through the iTunes store's podcasts section (The Plate Meeting on iTunes), Google Podcasts, TuneIn, and other podcast providers listed on the Anchor.fm page. Related Link: Jim Evans Academy of Professional Umpiring's 2018 California Classic (10/22-10/27). Related Link: United Umpires Profile of Chris Hubler || Force 3 Pro Gear. Straight from the Podcast to a Case Play! With a runner on third and less than two out, the pitcher is called for a balk during his delivery. He nonetheless completes his pitch and the batter swings and hits a line drive to right field, easily jogging to first base safely, as the plate umpire calls catcher's interference because during his swing, the batter's bat touched the catcher's glove. Baserunner R3 remains on third base for the entirety of the play. After the umpires call "Time," the defensive manager appeals to the plate umpire that the offense has batted out of turn. The UIC confirms that the offense indeed sent the improper batter to the plate. What's the call?